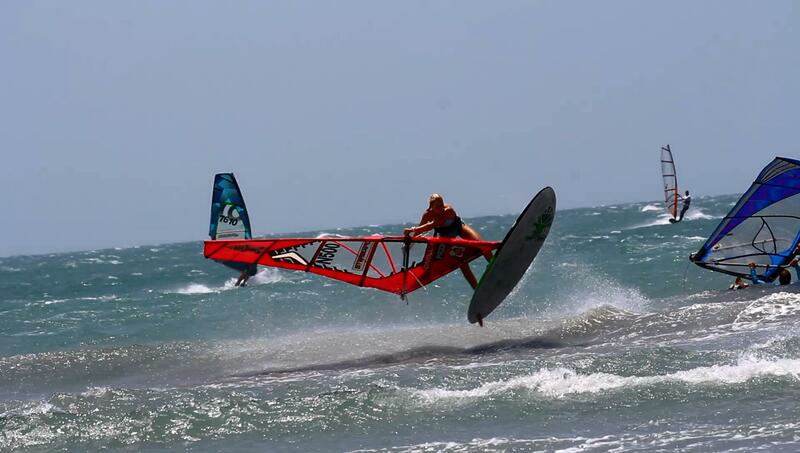 For my winter training this year I decided to travel back to one of my favourite places for windsurfing, Jericoacoara. To get here, from Norway, took me more than 50 hours, instead of 16 hours. Some delayed flights, flat tire on the flight, things falling apart inside the flight and so on… But finally I made it to Jericoacoara, in Brazil. Jeri is really famous for the strong wind the months before Christmas. You can sail everyday with sails between 3.6 and 4.4. I have spent one week here now, and the two first days I was sailing on my Flare 91 and Freek 4.0. Landed some new moves like Shaka into Flaka and spin loop (which I’m not a big fan of…yet!) After a few days I had to rig my 3.6 as the wind increased more and more. One of the days, I left the water after just 40 minutes as the wind was too strong. I had so many hard crashes, but when you land your moves in this wind it’s a great feeling, as you can rotate the moves twice as fast. I haven’t sailed 3.6 once the last two years, so I tell you it was strong. After a week with many hours on the water, I got some problems with my foot, due to too much sailing. It is getting way better now, so tomorrow I will be back on the water again. Jeri is a really special place for me as I spent so many months of my life here the past three years. The day I arrived I did everything that Jeri has to offer. I sailed, ate Acai, Miller’s cheesebread, Na Casa Dela with the girls here, and at the end some hours of Forro! A perfect start of my three months stay here. In a few days there will be more sailors arriving here, including my boyfriend who is having his final exams soon! Looking forward to see more friends here the next days.